Pictured here: Lucia, Francisco, and Jacinta. 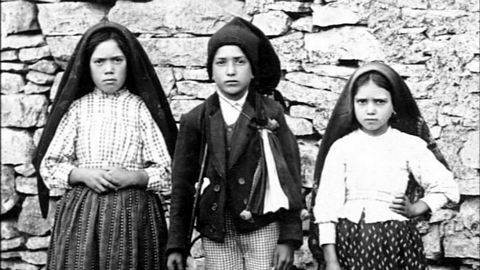 The abduction of the Lucia, Francisco, and Jacinta on August 13, 1917, by the mayor, stops the visit with the Mother of God and delays it until the children are free six days later. This abduction is a ploy to force the children to reveal the Secret entrusted to them by the Mother of God during the previous apparition. “As before, I arrived very early at the Cova and sat down near the little tree where our Lady had appeared. I went in spite of the fact that many people had tried to frighten me out of going. There were rumors it was the devil who came, and that he would wait until many people had come, then open the earth and swallow us all. A woman from Caterina had told me this, but I was not afraid. With so much praying going on, I decided, nothing so evil could happen. I asked our Lady to guide me according to the divine will of her Son, and then I went. “The crowd this day was even greater than it had been in July. Oh, there were many, many more. Some came on foot and hung their bundles on the trees. Some came on horses. Some on mules. There were bicycles too, and everything else, and on the road there was a great noise of traffic. “It must have been around 11 o’clock when Maria dos Anjos, Lucia’s sister got there. She had some candles with her that she expected to light when our Lady came to her sister and her cousins. All around the tree, the people were praying and singing hymns, but when the children did not appear, they began to get impatient. Then someone came from Fatima and told us they had been kidnapped by the mayor. Everyone began talking at once; there was a great anger, and I don’t know what would have happened if we hadn’t heard the clap of thunder. “It was much the same as the last time. Some said the thunder came from the direction of the road and others said it came from the tree. To me it seemed to come from a long way off. But wherever it came from, the thunder was a shock to the people. Some of them began to shout that we would be killed. We all began to spread out, away from the tree, but, of course, no one was hurt in any way. Just after the clap of thunder came a flash of lightning, and then we began to see a little cloud, very delicate, very white, which stopped for a few moments over the tree, and then rose in the air until it disappeared. As we looked around, we began to notice some strange things we had observed before and would see again in the months to follow. Our faces were reflecting all the colors of the rainbow – pink and red and blue – and I don’t know what. The trees suddenly seemed to be made not of leaves, but of flowers. The ground reflected these many colors, and so did the clothes we wore. The lanterns that someone had fixed to the arch above us looked as though they had turned to gold. Certainly our Lady had come, I knew, even though the children were not there. [Source: pp. 115 – 117, The True Story of Fatima by Fr. John de Marchi, Imprimatur 1952]. “Reluctantly as a Catholic priest, I beg to make known and to declare the following before all those who may know or hear rumors – infamous and damaging to my reputation as parish priest – that I was an accomplice in the imprisonment of three children in my parish who assert that they have seen our Lady. “I make this statement on the authority of the parents and for the satisfaction of the 5,000 to 6,000 persons who came many miles and with great sacrifice to see and speak with them. I deny this infamous and insidious calumny, and declare before the whole world that I had nothing whatever to do, directly or indirectly, with this impious and sacrilegious action. “The mayor did not confide his intention to me. And if it was providential – which it was – that he acted secretly and without any resistance on the part of the children, it was no less than providential that the excitement to which this diabolical rumor gave rise was calmed, or the parish would certainly have had to mourn the death of its priest as an accomplice in the crime. That the devil did not succeed in this, was due certainly to the Virgin Mother. “The mayor, after a protracted interrogation in their own houses, had the children brought to mine under the pretext of collecting more accurate information about the secret which they had refused to reveal to anyone. Then, at the time when he judged opportune, he ordered them into the carriage, and telling the parents that he was taking them to the Cova da Iria, in fact took them to Vila Nova de Ourem. Why did he choose my house from which to act? In order to escape the consequences of his action? In order that the people should riot, as they did, and accuse me of complicity? Or for some other reason? “I do not know. I only know that I deny all responsibility in the matter, and leave judgement to God. No one can prevent a work of God. “Thousands of eyewitnesses can attest that the presence of the children was not necessary for the Queen of Heaven to manifest her power. They themselves will attest to the extraordinary phenomena which occurred to confirm their faith. But now, it is not a trio of children, but thousands of people of all ages, classes and conditions who have seen for themselves. “If my absence from the Cova, as parish priest, gave offense to believers, my presence as a witness would have been no less objectionable to unbelievers. The Blessed Virgin has no need of the parish priest in order to manifest her goodness and the enemies of religion need not tarnish their benevolence by attributing the faith of the people to the presence or otherwise of the parish priest. Faith is a gift of God and not of the priests. “This is the true motive of my absence and apparent indifference to such a sublime and marvelous event. This is why I have not replied to the thousand questions and letters, which have been directed to me. The enemy is not asleep, but like a roaring lion. The apostles were not the first to announce the Resurrection. I abstain from any narration of the above-mentioned facts on account of the length of this letter, and because the Press will most certainly have given its own accounts. [Source: pp. 117 – 119, included in full, as a footnote, The True Story of Fatima, by Fr. John de Marchi, Imprimatur 1952]. The Real St. Michael Prayer!